Learn how to make one of Scotland’s favourite delicacies - haggis! Co-founder Andy Waugh talks participants through the history of Haggis before a hands on experience preparing your very own haggis chieftain to take home. Haggis masterclasses are held most Thursday evenings at 7pm at our Devonshire Square Restaurant. Please arrive 6.30pm for class commencing at 7pm. Not valid in conjunction with any other offer. Valid from 3/1/19. 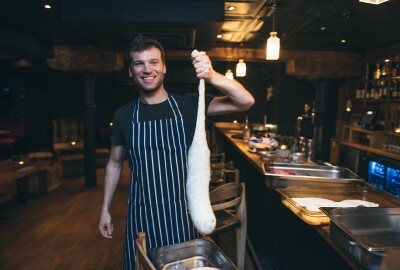 Haggis making classes run most Thursdays at our Devonshire Square Restaurant at 7pm. Vouchers can be redeemed for reservations on these weekly classes subject to availability. Alternative dates may be considered but cannot be guaranteed. Terms & conditions apply.